If you are new to Krav Maga, the first step is to complete the Krav Maga Fundamentals course. In this course you will learn highly effective self defence techniques straight away and it will prepare you for joining upper level classes and completing gradings. 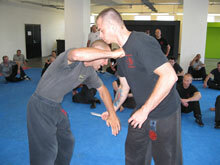 This course is a practical, hands on introduction to Krav Maga and its basic principles. Participants finish with a good understanding of Krav Maga and practical experience on how to effectively deal with a variety of basic violent assaults in a realistic manner. This course is suitable for anyone who is new to Krav Maga. We have had many people who were completely new to martial arts and self defence complete this course as well as LE and Military operators, black belts and instructors from other systems. Warning: These courses sell out extremely fast and spots are strictly limited. If you intend to join this course, we urge you to book today or risk missing out till the next intake. Please note: If you are joining us for the first time please download the KM Exercise History Questionnaire and KM Liability Waiver, fill it in and bring it with you to your first class. If you prefer to pay in person, come visit us during training hours. Please call ahead to ensure availability. Pick a month to start your training. Details of times below. No sessions Easter Monday April 22nd or April 25th Anzac Day Public holidays.